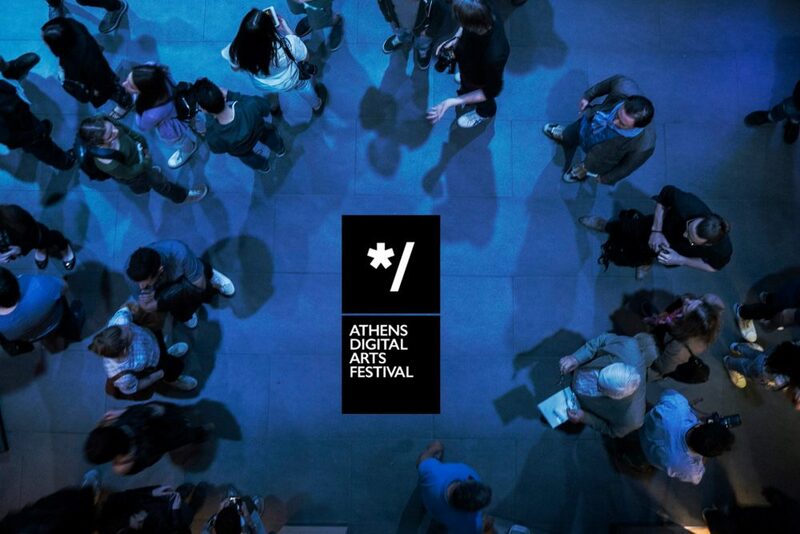 Athens Digital Arts Festival (ADAF) has successfully completed its 13th edition that took place from 18 to 21 of May at a venue of very interesting architectural perspective, at 23 Mitropoleos Street, by courtesy of “NBG PANGAEA REIC” in support of ADAF. This year, as we integrated at the programme “PEPP – Regional Operational Programme ATTICA 2014-2020 – European Regional Development Fund – With the support of Greece and the European Union”, we’ve been given the chance to attract more and diverse visitors due to our free entrance, to expand our audience through multiple acts and to develop our activities during the year. Furthermore, we presented international festivals with exclusive content and guests, such as Japan Media Arts Festival (Japan), MashUp Film Festival (France), ArtFutura (Spain), Imagine Science Films Festival (U.S.A), Videonale E.V. (Germany), Mapping Festival (Switzerland), VideoFormes Digital Arts (France). ADAF 2017 collaborated with the Ministry of Culture and Sports presenting for the year of cultural exchanges between Greece and China, the special event #PostFuture Dialogues, offering to the audience the opportunity to enjoy installations and screenings by Greek and Chinese famous and upcoming artists in public and private places, as well as a tribute to Microwave International New Media Arts Festival. In addition, ADAF presented the 24hour artist projection “Digital Canvas” that was broadcasted by IkonoTV and the rich compilation of video-art short films and animation in collaboration with the international digital platform The PhotoPhore. Another great collaboration that we established was with GERMANOS (Powered by GERMANOS). The Festival expanded its horizons, introducing new technologies in the field of digital arts. ADAF and GERMANOS joined forces and organized multiple important actions, such as the VR Creations Contest, presenting the first VR gallery with artworks of the audience. In this edition, the festival has also enriched the kids program, ADAF Kids, offering to the kids and their parents the chance to explore the magic world of digital culture, through educational workshops, technological experiments, animation screenings and interactive installations. Kids learned the secrets of 3D Printing, painted digital graffiti and made a moving flower robot by playing with light sensors. More than 17.000 visitors attended ADAF 2017 and had the opportunity to get closer to digital culture and get familiar with new artistic practices. The audience luxuriated a special tribute to the unique digital persona of Theo Mass Lexileictous, got transferred to infinity through the interactive installation Infinity Room by Refik Anadol the was supported by the Delegation of European Commission and the European Parliament Office in Greece (Europe4All, #EU4U), flew to magical dreams with the interactive VR installation Immersio by Immersio Group, and watched web art with the unbeatable speeds of COSMOTE VDSL. Finally, every night the Theater of the Festival was enabling entrance toto different dimensions with the audiovisual performances by renowed and award winning artists such as Kenta Nagakawaga, NOHlab και Audiofil, Marco Donnarumma, ο Fraction, ο Doron Sadja, οι Stratofyzika και ο Martin Messier, Pandelis Diamandides, François Zajéga and Loïc Reboursière. We would like to thank you all for participating and supporting this year’s edition and we are looking forward to seeing you back again in Athens Digital Arts Festival 2018 with the promise of an even more complete experience. Stay tuned because the #PostFuture is still here!